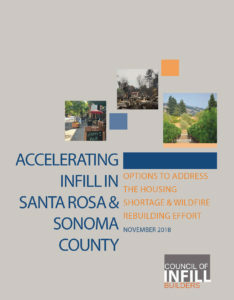 Santa Rosa, CA – The Council of Infill Builders released the new report Accelerating Infill in Santa Rosa and Sonoma County: Options to Address the Housing Shortage & Wildfire Rebuilding Effort. Following the devastating Sonoma County wildfires in October 2017, which destroyed about 6,000 homes county-wide and over 3,000 in the City of Santa Rosa alone (at least 5% of its housing stock), the Council of Infill Builders convened state and local public officials, real estate investors and developers, local business leaders, and other stakeholders to discuss options to rebuild homes in a more sustainable, infill-focused way. The report finds that to rebuild 30,000 homes over the next five years in existing urbanized downtown neighborhoods to meet demand, stakeholders will need to overcome challenges related to market uncertainty due to unknown demand for infill, a lack of demonstrated viability and financing for infill, a lack of policy and process commitment to support infill development, and high costs and fees on infill. Pilot projects with public partnership with possible concessions regarding fees, land purchase, and streamlined entitlements. Rent guarantees for employees from employers to boost demand for infill. A Joint Powers Agency (JPA)/Renewal Enterprise District (RED) to guide and fund infill development. Zoning, parking requirement, and development fee reforms to encourage rather than stymie infill development. Improved availability of public sector infill financing and enhanced access to sales and use taxes. CEQA streamlining for qualifying infill, as contemplated by legislation like AB 2267 (Wood). A market study and project development navigator to help streamline infill investment and deployment. You can read Accelerating Infill in Santa Rosa and Sonoma County here and download the press release. On October 7th, Governor Brown signed Assembly Bill 1568 (Bloom): “Neighborhood Infill Finance and Transit Improvements Act” (NIFTI). NIFTI authorizes local governments to finance infill projects within an enhanced infrastructure finance district based on future tax revenue increases, such as from sales and occupancy taxes. This innovative new financing tool will help California’s cities and counties build sustainable, equitable infill projects to address the housing shortage and meet the climate goals in Assembly and Senate Bills 32. The Council of Infill Builders thanks our partner organizations for this legislative success, including Natural Resources Defense Council, Planning and Conservation League, Housing Advocates, Housing California, Public Advocates, and Western Center on Law and Poverty, among others. For more information, please see the full bill text and fact sheet from the California legislature. 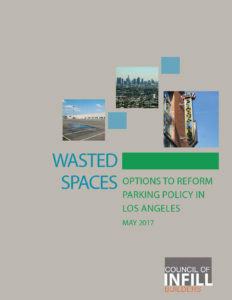 Los Angeles, CA – The Council of Infill Builders released the new report Wasted Spaces: Options to Reform Parking Policy in Los Angeles. Based on an expert convening in January 2017, the report finds that excessive parking requirements for new development, lack of adequate pricing and enforcement for existing parking spaces, and failure to better manage parking assets in the region wastes space, drives up housing prices and rents, and limits overall mobility in the region. You can read Wasted Spaces here and download the press release. This interactive conference at Los Angeles City Hall (Bradley Tower room) will feature parking reform options to boost transit neighborhoods. The event is co-sponsored by Councilmember Jose Huizar and TransitCenter and will launch the new Council of Infill Builders report “Wasted Spaces” on parking reform. 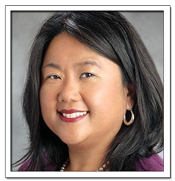 Seleta Reynolds, General Manager, Los Angeles Department of Transportation will provide the keynote address, followed by a panel discussion. See the agenda for more details. Register to attend today — space is limited! 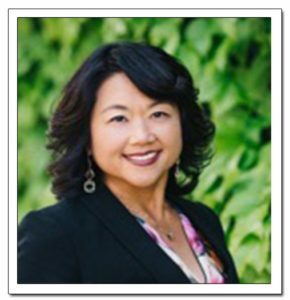 Fresno, CA – The Council of Infill Builders released a new summary of steps that Fresno leaders and state officials can take to boost infill development, renewable energy deployment, and energy efficiency retrofits, while preserving farmland. The summary report resulted from an evening discussion at Fresno State on January 21st, featuring state and local officials, business leaders, policy advocates, and other land use experts in Fresno and surrounding communities. You can read more about that event here. 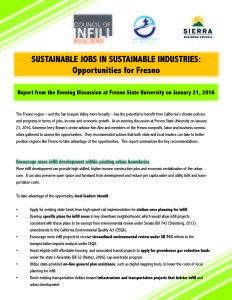 “Sustainable Jobs in Sustainable Industries: Opportunities for Fresno” provides action items for state and local leaders on each of these critical topics. For more information, please see the PowerPoint presentations from the evening event here. The bill also amends the parking ratio for affordable housing and senior housing to require no more than 0.5 parking spaces per unit, and it amends the ratio for special needs housing to require no more than 0.3 parking spaces per unit. Partner organizations were critical to the this success, including AARP, Local Government Commission, TransForm, Circulate San Diego, American Planning Association, California Council for Affordable Housing, California Economic Summit, and Enterprise Community Partners, as well as individuals like Professor Donald Shoup of UCLA and Jeffery Tumlin of Nelson Nygaard, among many others. For more information, please see the full bill text and fact sheet from the California legislature. 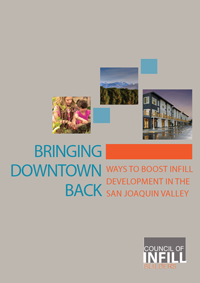 Sacramento, CA – The Council of Infill Builders released a new report that identifies key barriers and recommends solutions for investing in the once-vibrant city centers of San Joaquin Valley communities. “Bringing Downtown Back: Ways to Boost Infill Development in the San Joaquin Valley” resulted from a convening of Valley builders, public officials, financial leaders, and land use experts in Fresno to identify the challenges cities face in efforts to meet the emerging demand for walkable, convenient neighborhoods. For more details, visit our Bringing Downtown Back page. View the Press Release. San Francisco, CA – Developer Patrick Kennedy of Panoramic Interests used four years of research and development to design the first pre-fab, micro-apartment project in the United States. 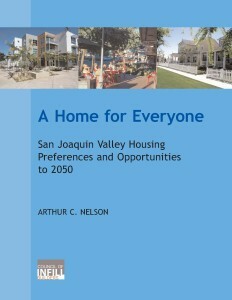 The project objectives include: maximizing productive value of a constrained, in-fill development site; delivering car-free, affordable, entry-level housing, close to public transit and jobs; minimizing construction waste, environmental impact, and disruption to neighborhood; achieving LEED Platinum, maximize sustainability, and minimize energy consumption; demonstrating market viability of well-designed micro-apartments. The project has already been recognized for its innovation. 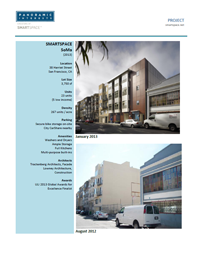 Learn more about the project: SmartSpace and its Planning Aspects. Bakersfield, CA – The Council of Infill Builders released a new study of forecasted housing demand in the Central Valley through 2050, showing that the Valley will need significantly more compact, walkable homes to meet future demand. For more details, visit our Reports page.